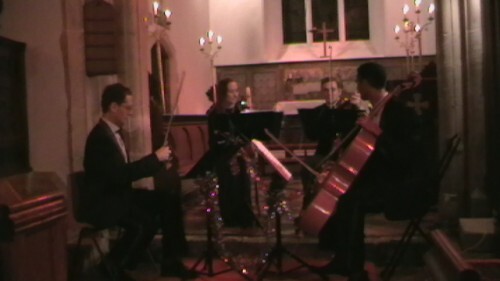 On Friday the 11th December we all really got into the Christmas spirit with a string quartet concert of winter and festive music performed by candlelight in our village Church, St Giles, Cheddington, Buckinghamshire (on the border with Hertfordshire). This is the fourth time we’ve performed in the church and word seems to have got around because by the week of the concert, the organisers had sold out of tickets and posters had to be taken down because the church was already at full capacity. They’re all smiling now…just you wait…. Our brief¬†was to play music on the themes of Winter and Christmas so I had lots of arranging to do, particularly of Christmas carols (since published arrangements for string quartet are often quite basic and lacking in detail). In the end, we carefully put together a programme to include a mixture of well loved carols (many taken from our CD entitled ‘I Saw Three Ships and other carols’) with seasonal favourites such as the ‘Christmas Concerto’ by Corelli, ‘Winter’ by Vivaldi, some of my own arrangements of pieces from Handel’s¬†’Messiah’, popular pieces from the Nutcracker by Tchaikovsky, In the¬†Bleak Midwinter by Holst¬†and of course ‘Sheep May Safely Graze’ by J.S Bach. 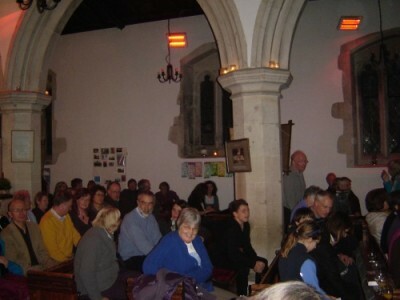 When we arrived at the church, the audience were already starting to find their seats and the church looked utterly magical with hundreds of little candles and lanterns on every ledge and beam. 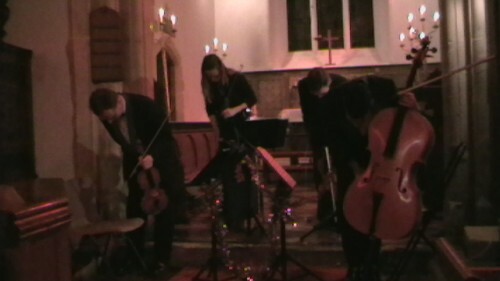 With most audience members ready with a complimentary glass of hot mulled wine in their hands we opened the concert with my arrangement of the traditional carol ‘Once In Royal David’s City’ – starting with a simple solo cello line which is joined by the other instruments one by one,¬†until the whole quartet¬†takes up the melody. As usual, before each piece we spoke a little about the¬†origins¬†of the piece or the composer which many audience members commented was really enjoyable and had them listening more closely. Throughout the concert, we included a few excerpts from Handel’s Messiah which I had arranged for string quartet – here is a clip of no. 13 Pifa (or ‘the Pastoral Symphony’). With more mulled wine and mince pies enjoyed by all during the interval, towards the second half of the concert we broke out some lighter pieces and entertained everyone with a lively rendition of ‘the Twelve Days of Christmas’,¬†which¬†became quite comic with¬†us frantically standing up and sitting down as we each got the solo line of the music. Adrian (who performs all¬†his own stunts) became very expressive with his part and enthusiastically¬†jumped onto his chair at one point, much to the delight of the audience. Tense moments as the viola player attempts to remove his bow from his nose…. We finished with two encores, firstly a ‘Champagne Galopp’ by Johann Strauss senior where the composer instructs the musicians to make a ‘popping noise’ towards the end of the piece. Our interpretation of this was to use party poppers which we had hoped to co-ordinate with rests in the music but which ended up being rather random and chaotic, unfortunately leaving the floor of the church with rather a lot of streamers and debris. Overall though this was terrific fun for the musicians and audience alike and we were called back for a second encore when we repeated a rousing version of ‘I Saw Three Ships’. Next Friday, we are performing a similar concert at the Church of St Michael in the North Gate, in Oxford. Hang ye heads in shame….